On a regular day, a late-night party with your friends or a late dinner may shift your sleep routine slightly. During those end-of-the-year celebrations, however, this can quickly become a habit. You may be staying up only an hour later than normal or just sleeping more during the day. Even a slight alteration has the potential to keep you up night after night. In either case, Sleep.org suggests you maintain a sleep schedule that doesn't compromise your rest. Sacrificing quality sleep for an additional helping or a few more hours of fun isn't worth it. You'll likely be crankier and unable to fully enjoy the festivities. Whether you're less tired or more tired, train your brain to stick to its normal sleep/wake cycle. That way, you won't miss out on quality sleep and quality time with your loved ones. Doctors recommend you eat smaller portions at dinner time, but when you want to savor every morsel of that holiday feast, eating smaller portions sounds like torture. It's even harder for those dieting. 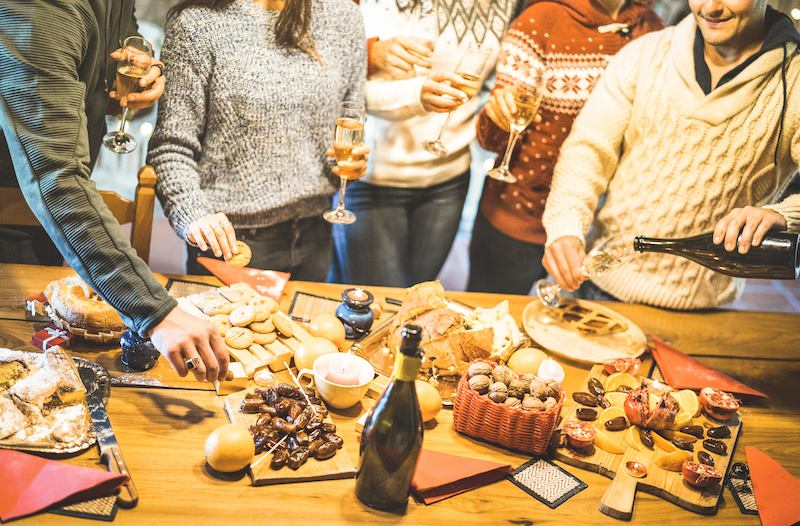 This holiday season, put your goals aside and focus solely on maintaining your current weight. The Huffington Post argues that yearly goal-setting is not readily feasible during the holiday season. With gifts to buy, dinners to cooks, and decorations to hang, you're swamped by the time you sit down to eat. Take the stress off your diet by removing the burden of losing weight. You may not be at your ideal body size, but staying within certain limits can be a big boost to your confidence and your sleep. Overeating leads to gas and bloating, which can make for an uncomfortable night. The same goes for indigestion and heartburn. So forget the goals for a while. They can wait. Your sleep can't. Do you find sleep less than satisfactory when you travel? On those family vacations, you don't have access to the foods you'd eat regularly, which can throw off your diet. Superior home-cooking certainly doesn't help matters. You may not want to purchase groceries on your vacation, but the payoffs for your sleep are worth the added shopping time. A list on the website Eating Well mentions kale, kiwi, and salmon as some of the top foods to fit into your meals. With many of the selections that increase the sleep hormones melatonin and serotonin, you'll erase that uncomfortable jet lag and start sleeping like a baby. And feeling great to boot! The temperature's decreased, but your exercise shouldn't. If you're not a skier or snowboarder, it can be difficult to get the recommended 30 minutes of daily activity during the winter season. That doesn't mean you should give it up entirely. Stay inside and dance to your favorite song. Try a workout DVD or a take a run on the treadmill. Lift a few hand weights. Anything you do helps move toward a healthy mind and a restful night. Dietician Dr. Jessica Katz suggests taking a walk after dinner to ease the digestive process. You'll feel less bloated, and less stressed, solely from a little cardio. Don't overdo it at night, however, or it might cause serious stomach cramps. Your sleep shouldn't suffer during the holidays. Maintaining your diet, your sleep schedule, and your exercise routine are critical to keeping your rest undisturbed. Just don't stay too rigid to your schedule. It's as important to adapt to our environment as it is to maintain, so work on achieving a balance between eating what you love and what you need while finding a sleep pattern that fits into your hectic holiday plans. A bit of flexibility can do wonders for your stomach and your sleep.